Around 5 o’clock it began to get dark and the wind really started to blow very hard. In addition to being secured to the buoy our ships were tied together with 6” manila line quadrupled at four points—bow, stern, and two spring line positions. In spite of all this, the wind became so strong it tossed that buoy around so much that the YMS on the starboard side broke its anchor chain and ripped all the lines off and drifted away. The storm intensified to the point the wind got between the bows of our two remaining ships, forcing them apart, stretching the manila lines and then crashing the ships back together again. Too much damage was being done so we decided since we still had both our anchors we would be better off letting go the cable to the buoy and the lines and dropping an anchor. We had our engines running to ease the tension while releasing the lines but the stern line was stretched out so tight it couldn’t be let go from the bits and the men on each ship were using axes to chop off the line. Unfortunately, the men on the other ship got the line free first and the loose end was immediately sucked under our stern and fouled our starboard screw, causing the starboard engine to stop. As we then drifted down wind we dropped one of our anchors which took hold and brought our bow up into the wind. By this time the wind was so strong it whipped up the waves into a driving froth that cut visibility to practically zero and even disrupted our radar. One of the ships with us was an LCI used for carrying buoys and other equipment. 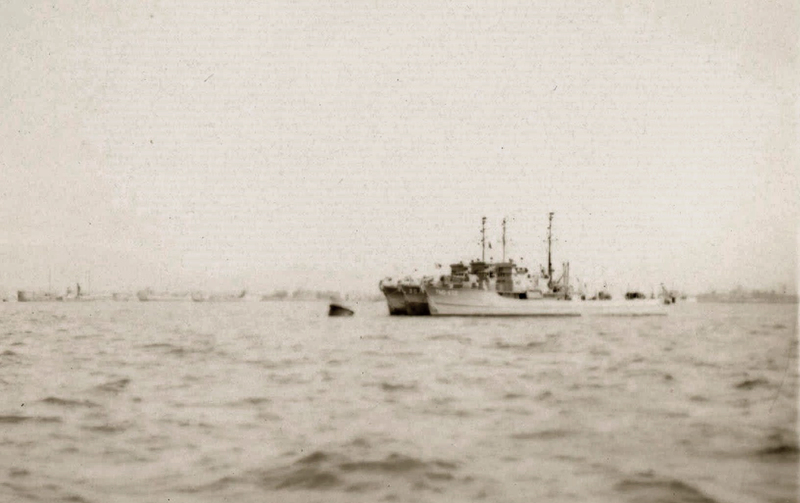 Normally, they served as a landing craft and had a stern anchor for pulling themselves back off the beach. In this case they used it and let out a great deal of cable. Conditions being what they were, it was some time before we discovered we were dragging our anchor and it had snagged the LCI’s anchor cable causing us to slide right up to him before we knew it. Luckily, we got clear after only a light bump amidships that did no damage. However, with both ships essentially on his anchor the howling wind drove us down toward three fleet minesweepers who each had two anchors spread out and couldn’t move. They did see us, however, and radioed, “YMS-468, you are embarrassing us,” as if we did not have enough trouble ourselves! All we could do was let go our anchor, reverse our one remaining engines and hope to back up into the wind and get clear of these other ships and drop our one remaining anchor in a safe location. We succeeded in doing this and rode out rest of the storm which ended about sunrise the next morning. In preparing for the storm the Exec had what seemed to be a good idea securing our one and only lifeboat normally stowed amidships to the two davits swung out over our squared off stern, complete with outboard engine attached and ready to go. Trouble was we never expected to lose an engine and have to back down into a typhoon driven sea. Consequently, when we backed into the first wave it crashed up under the lifeboat and carried it away in one big swoop leaving just a few short pieces of wood dangling from each davit. Before the beginning of the storm we had raised a brand new flag and the next morning all we had was the white tape with a few red, white and blue threads hanging out of it. The Japanese name for the storm is the Makurazaki Typhoon of September 17th, 1945 and was the 2nd worst typhoon in their records. In fact it plowed up through Kyushu and Hiroshima resulting in thousands of Japanese deaths caused by torrential rains, flooding, and mudslides. The next few days were spent recovering from the storm and getting ready for our next operation. 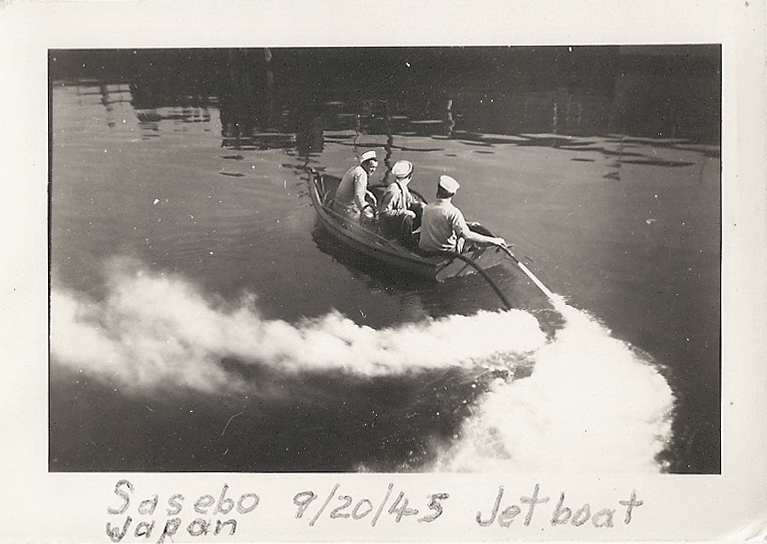 During this time we needed some means to get around and somehow the men managed to acquire a Japanese fisherman’s rowboat. That was when I had a great idea. Since our outboard motor went the way of our lifeboat, I thought of a temporary solution. For damage control purposes and pumping out bilges we had a gasoline engine driven pump called a “handy billy” so by putting this in the middle of the rowboat with the suction hose forward and the discharge hose out the back we could get around very nicely. Here is a picture of some of the boys underway. We also put a hose on the engine exhaust and directed that out back too. I’ve often thought that this is the principle behind today’s recreational jetboat and I missed a great opportunity to start a new industry! Isn’t 20/20 hindsight a wonderful thing! This entry was posted on March 17, 2014, 10:27 pm and is filed under During Battle, Letters, Photos, Soldiers, Stories, YMS-468. You can follow any responses to this entry through RSS 2.0. You can leave a response, or trackback from your own site. would be able to obtain a blank VA 10-5345 copy to fill in ? Handy billy was/is a common emergency portable pump that was placed aboard most US Navy ships since WWI. Formally designated "P50", because it pumped 50 gallons per minute, was gasoline-powered and could be used to fight fires or during flooding conditions, in conjunction with other pumps on the ship. It was especially valuable when the ship lost electrical power and normal pumping ability was lost. On smaller ships, it was a critical piece of equipment and could be easily transported from place to place by two strong crew members, one at each end, as it weighed 160 pounds during WWII. Makurazaki Typhoon hit Hiroshima on September 17th, 1945, leaving 1229 dead, 1054 injured, and 783 missing in Hiroshima Prefecture. A davit is a system that is used to lower an emergency lifeboat to the embarkation level to be boarded. The davit has falls (now made of wire, used to be manilla) that are used to lower the lifeboat into the water. Davits can also refer to single mechanical arms with a winch for lowering life rafts and raising spare parts onto a vessel. Landing Craft Infantry (LCI) were several classes of seagoing amphibious assault ships of WWII used to land large numbers of infantry directly onto beaches. Also amidships; A Naval term for the midsection of a ship or plane; between the bow and the stern.